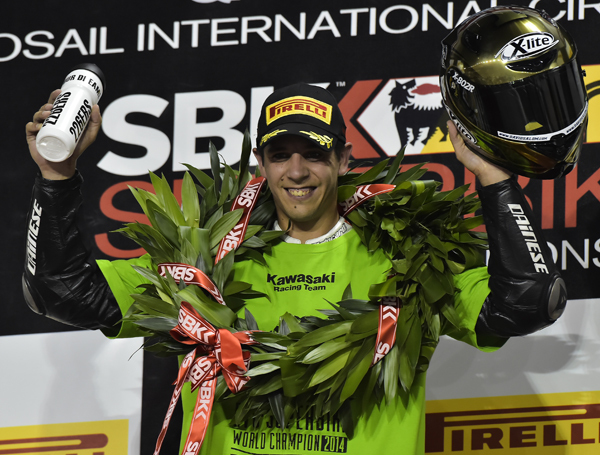 Motogear | Qatar WSBK: David Salom wins the EVO Championship! X-lite pilot David Salom has won the WSBK Evo championship! He wore a special edition X-lite lid for the finale of the SBK 2014 championship. It was a disappointing weekend for Nolan and Gaerne pilot Marco Melandri as he missed out on third position in the championship by just one point. An eighth in race one and a 4th in race two meant that Melandri was overtaken in the table by PATA Honda rider Jonathan Rea. The Championship was won by Melandri’s team mate Sylvain Guintoli – 6 points clear of Brit Tom Sykes. X-lites Chaz Davies finished overall in sixth position after a finishing 6th and 7th over the weekend. In the EVO class, third place went to Guarnoni , the fourth to Barrier and the fifth to Camier – all X-lite wearers. In the Supersport Championship – Factory Five rider Jules Cluzel finished the championship second. Nolan, Xlite, Five-gloves, Gimoto and Gaerne are all looking forward to a positive 2015 racing season. Nolangroup now has a total of 49 world champions!